Businesses and organisations rely on communication in order to thrive and continue their success; whether it is talking to clients and customers or communicating within the workforce, having a solid communication platform is vital for a company. Up until now, the traditional public switch telephony network was the go-to communication strategy for businesses, however with the fast expansion and developments of the internet, VoIP is now the system that has become heavily invested in worldwide. VoIP, which stands for Voice over Internet Protocol is a type of telephony platform that works through the internet. Unlike PSTN, Public Switch Telephony Network, VoIP converts the voice into small digital IP packets, and sends it through the internet to its final destination or receiver. Before the packets reach the desired destination, the IP packets are reconverted into the original analogue signals – your voice. VoIP is fast becoming the go-to telephony platform to invest in, and its flexibility means that the system can be used in a wide scope of industries and workforces. Often with many VoIP packages, clients will be offered a series of additional benefits such as minute’s packages and upgraded handsets. Why should you invest in VoIP for your business? VoIP systems do more than just increase your savings, they also enable users to integrate with other software programmes such as email, e-fax and remote conferencing whilst still engaging in phone calls - therefore optimising productivity in the workplace and potentially increasing company revenue and ROI (Return on Investment). A huge benefit of VoIP is it’s flexibility, meaning employees can take the office anywhere with them, as it’s possible to conduct a telephone call at any location that offers an internet connection. This type of mobility for the telephony system means that employees who are on the move can still complete their work, and are still contactable at all times. Long distance calls through VoIP are incredibly cheaper than traditional mobile phone calls. VoIP relies purely on internet to be able to perform which means factors such as bad weather, location or lack of signal do not affect the connection or clearness of the call. Providing there is an internet connection, VoIP will run smoothly, allowing for faultless networking regardless of the environment that it is taking place within. VoIP is incredibly reliable, and does not carry the risks of a faulty connection that landlines can often have when working in certain conditions. If you are in a job role that requires regular liaisons with clients or customers, VoIP is perfect for enabling you to do this while working remotely. With VoIP, calls made to the office number can ring both the office and an assigned mobile number which is also connected and working through VoIP. This means that even if you are out of the office, clients and other out-of-house contacts can still reach you, therefore ensuring you stay ‘in the loop’ with all your tasks at hand. You’ll have a predicted monthly cost based on the type of package you have chosen. There will be no nasty surprises of additional bills, and each monthly bill will be consistent every month. This means your budget remains organised – leaving you time and money to spend on other aspects of your business’s strategies. 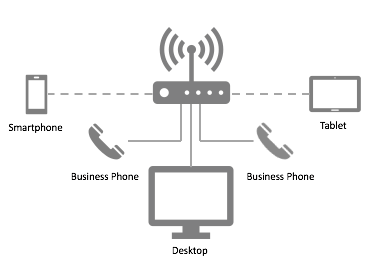 Why is VoIP better than a traditional landline telephony platform? Communication over IP network can be performed at significantly lower rates and is much cheaper compared to landline calls. It is a cost-effective alternative to the former traditional telephony platform and is much more economical when it comes to international calling and long-distance calling. When it comes to technological capabilities, VoIP undoubtedly prevails over traditional landlines. VoIP for business solutions are full of cutting-edge technology that can support a wide variation of advanced features to optimise the convenience and organisation for your business when it comes to networking. It is important to assess what you need from a telephony system before you decide to make the switch, as the success and advantages of VoIP depends on what type of company you will be using it in, and your scale of networking and communication. VoIP will guarantee you a series of different benefits however only if your business is in a position to reap the benefits. For example, a small independent shop may not benefit massively from the installation of VoIP due to the fact that it does not rely heavily upon over-the-phone communication. However, a customer service centre or a telesales unit will undoubtedly gain from the advantages a VoIP system installation can offer as they are types of businesses that are ran majorly through telephone communication. As leading network and telecommunications providers, Armstrong Bell have two different hosted voice systems to choose from – both of which offer a wide range of features that can support business communication and networking. Venture – This system has been specifically designed to replace the PBX market with the same user’s needs in mind. The system is rich in features and works well in any small or medium-sized workforce. In one single system, Venture can meet every one of your SME and enterprise requirements. Read more about Venture here. Enterprise – Enterprise is a fully hosted telephone platform specially designed to offer scalability and flexibility to your business at extremely low costs. The system boasts a wide range of features that help to provide unified communications between employees and clients alike, to identify and supply new products and services that your business offers. Read more about Enterprise here. Make Armstrong Bell your go to! If you are looking to invest in a VoIP system for your business or organisation, Armstrong Bell can certainly help. With decades of experience under their belts, the entire team have established themselves as leading experts in the telecommunications industry, and have provided networking and communication solutions to a wide range of industries and establishments nationwide. Based in the Midlands but offering services across the entire country, Armstrong Bell have gained plenty of knowledge and experience with VoIP telephone systems, allowing them to determine the best fit for your site and install it quickly and simply with minimal disruption. Installing phone systems has never been easier with Armstrong Bell, and with a team of experts ready to complete the process, you can rest assured that your business will have its new system up and running in no time – you can even keep the same phone number for added convenience! The team will conduct a thorough assessment of your site in the preliminary stages of installation, before establishing the best system that will give your business the most benefits. This process ensures that your investments are being made based on the expertise of highly trained professionals – so you’ll be using a system that is deemed perfect for what your requirements are. If you are interested in finding out more about VoIP for business systems, click here. Alternatively, you can call 01527 834850 to speak to a member of their helpful and friendly team.